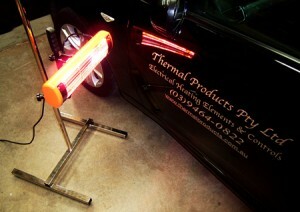 Combining all the features of a flexible hand held heater, with all the benefits of a free standing paint dryer. The 1000 Series is the ideal model to complement any existing full size drying system. Used with the stand, it also becomes an ideal additional heat source or spot drying unit. This model is intended for use on small repairs and drying jobs. For example engine drying – stripe removal – filler drying and pre heating prior to spraying.